In recent months, there has been growing speculation about signs and symbols in the heavens and escalating world events predicting a soon and coming Rapture and Great Tribulation. At the same time, there is also a growing segment of the Church that isn’t looking for a Rapture, but a great spiritual Revival with the best days of the Church still ahead. There are well-known and respected leaders on both sides of the issue. Best-selling authors and several key evangelical leaders have been prominent proponents of the Rapture interpretations. The Left Behind series has had a huge impact on the Church. Yet, John Wesley, John Calvin, Jonathan Edwards, Charles Spurgeon, and many of the church fathers including Josephus, believed the “Great” tribulation that Jesus spoke of in Matthew 24:21 already happened within the first century church. These differences of biblical interpretation have been around for decades and they will probably continue in the days to come. The challenge we face as believers is finding that place of agreement where we can be “…like-minded, having the same love, being one in spirit and of one mind” (Phil 2:2). If we are not standing in faith for our future, we may nullify our own intercession in the present. “…if indeed you continue in the faith, firmly established and steadfast, and not moved away from the hope of the gospel that you have heard” (Col 1:23). We have a spiritual Adversary that will never relent. The spirit of fear is rampant around the world and we must keep our hearts and minds fixed on God’s goodness and His triumphant love. We must continually magnify Him and not the apparent darkness. Faith is what pleases God (Heb 11:6). Let us give more time and attention to what God is doing rather than on what the enemy is doing. “Christ loved the church and gave Himself up for her to make her holy, cleansing her by the washing with water through the word, and to present her to Himself as a radiant church, without stain or wrinkle or any other blemish, but holy and blameless” (Eph 5:25-27). It is to the Father’s glory that the Bride of Christ is ready for the return of the Bridegroom. He is looking for a Bride that is held in honor (radiant), free of moral faults (without stain), not old and tired (without wrinkle), blameless (holy), and free of any blemish (without moral blame or rebuke). UNTIL we demonstrate this reality, we have work to do. Let us pray that we would become a Bride that is fitting for the King. “Jesus went into Galilee, proclaiming the good news of God. “The time has come,” He said. “The kingdom of God has come near. Repent and believe the good news” (Mark 1:14-15)! We must never forget what we were commissioned to do – preach the kingdom of God so that the lost will be saved and empowered as sons and daughters of the King. Every day until Jesus returns provides another opportunity for those in darkness to see the light. Let us use this time wisely as good stewards of this good news. “The coming of the kingdom of God is not something that can be observed, nor will people say, ‘Here it is,’ or ‘There it is,’ because the kingdom of God is in your midst” (Luke 17:20). “And he called his ten servants, and delivered them ten pounds, and said unto them, Occupy till I come” (Luke 19:13 KJV). Scripture is clear that no one knows when Jesus is returning (Matt 24:36). What we do know is that we are here as ambassadors of another kingdom – His kingdom. It has always been God’s intention for His sons and daughters to represent Him here and demonstrate the power of that kingdom (Rom 8:19). Until He returns, let’s embrace our call and walk together “…until we all reach unity in the faith and in the knowledge of the Son of God and become mature, attaining to the whole measure of the fullness of Christ” (Eph 4:13). I am noticing a dilemma between, do we think the tribulation is soon, so be prepared. Is America in a particularly difficult situation (see z3 news and holy spirit wind, the latter was adamant there would be no last minute revival , though I will ask if he is just referring to the US) because they may be a modern day Babylon? However the UK prophecy sites are so confident that some form or other of revival is coming, and more gifts, release of power etc will be poured out, that life will be wonderful. Tribulation may get a line at most, but to me, I am sure that the 2nd coming will be 10-12 years away, maximum, which means the tribulation will start in 3-10 years and we are now in birth pangs. I also will say that for those that believe in a pre-trib rapture I am really sorry but I think you’ve got it very wrong, better to be prepared for trouble and be raptured early, then not be prepared and find yourself unprepared for trouble. Also, how are the countless numbers to be saved during the tribulation if you’ve raptured every single true believer out of the situation before the Trib. actually starts. So to restate the dilemma, is God pouring the good things in certain places and judgement in others (eg US, Caribbean, Australia if their votes go the wrong way). Is the UK so much better, I don’t think so – or will there be revival everywhere to strengthen Christians so they can cope with the tribulation? You have great points. Personally I am preparing by surrendering my life and will and growing in understanding of Him, He will speak through His Ruach HaKodesh ~ and let me know what to do both daily and long term. Focusing on Heaven and saving souls, but EL SHADDAI hasvhad me in the book of Revelations regarding pillars, keys ( David’s key in particular) Yeshua Messiah as the door, Ezekiel 44:2-4 and John 10, so He is speaking, I am listening. Thank you Wanda for this helpful reminder upon our needing to ‘keep the main thing the main thing’, as Bill Johnson often stresses. Wanda, very good points here. Keeping our eyes,minds,spirits on His purpose in us to be the living testimonies & witnesses of His great power that works in us to not just save us, but how to prepare us for leaving this earth and going home. 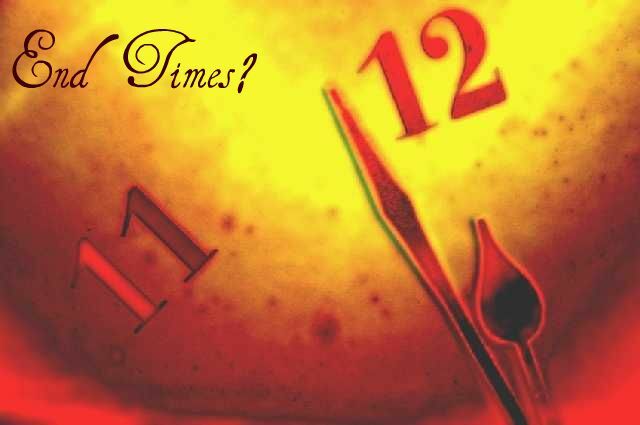 Yes we keep our eyes on the times, but our RUACH HA KODESH will tell us everything Father wants us to know. John 16 : 13. After living through Irma, at age 62, I am no longer anxious about the future. I saw my weak areas in my walk, now they are SURED up. I am sure that He is faithful. Amen. Amen! Whether there is a growing darkness or a growing light ahead for this world, the church has no place for gloom and doom. We are sons of Light! I repent of gloom and doom, and choose to walk in Light, Hope, Faith, and Love!